To every lover of football, Paul Gascoigne embodies both what is good and bad about the beautiful game. A naturally gifted player forged on the streets of the North East, his loveable personality off the pitch and sublime moments on it endeared him to a nation. At the same time, an addictive personality combined with the temptation of fame led to self-destruction, leaving many to wonder what might have been. 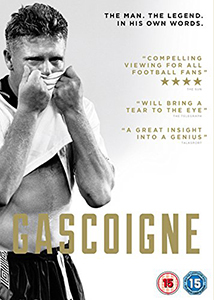 New documentary Gascoigne (2015) covers his early life, and his career up until around the end of Euro ’96. With most of the documentary told in a ‘one-on-one’ style similar to James Toback’s Tyson (2008), the fascinating moments are normally derived from glimpses into the footballer’s mind. The effect of personal moments, such as witnessing his best friend die in his arms at a young age, clearly haunt the 48-year-old to this day; while professional misfortune (two semi-final losses with England, a succession of injuries) is perhaps just as impactful for a man to whom football meant everything. It’s not all tragedy, however. The talent and adulation that met every kick is evident in reel after reel of fascinating archive footage, and hilarious anecdotes told by Gascoigne and Gary Lineker, a personable interview subject who clearly possesses a great deal of affection for his former teammate. Stories such as bringing an ostrich to training, or playing against Marandona in Italy while both players were drunk, are unlikely to be found in other chronicles of sporting heroes. And yet, it is what’s left out that becomes all the more conspicuous as the film goes on. Gascoigne’s alcoholism, depression and past indiscretions are touched upon, but never explored. Director Jane Preston rightly puts the football first, but there is so little mention of the demons that hounded his career and what is mentioned is simplistically put down to ‘bad luck’ or press intrusion. There is also a curious choice of talking heads, two of which seem to only be there for their status within the game. Aside from Gascoigne and Lineker, the only other contributors are Wayne Rooney (a young child for most of Gazza’s playing career) and Jose Mourinho, who shares very little with the player other than a friendship with late England manager Sir Bobby Robson. If the intention of Gascoigne is to depict events from the man’s own perspective, then it is understandable that the unfavourable moments of his life are glossed over somewhat. Nevertheless, as fascinating as much of the film will be for football fanatics, it ends with the sense that this is only half the story.